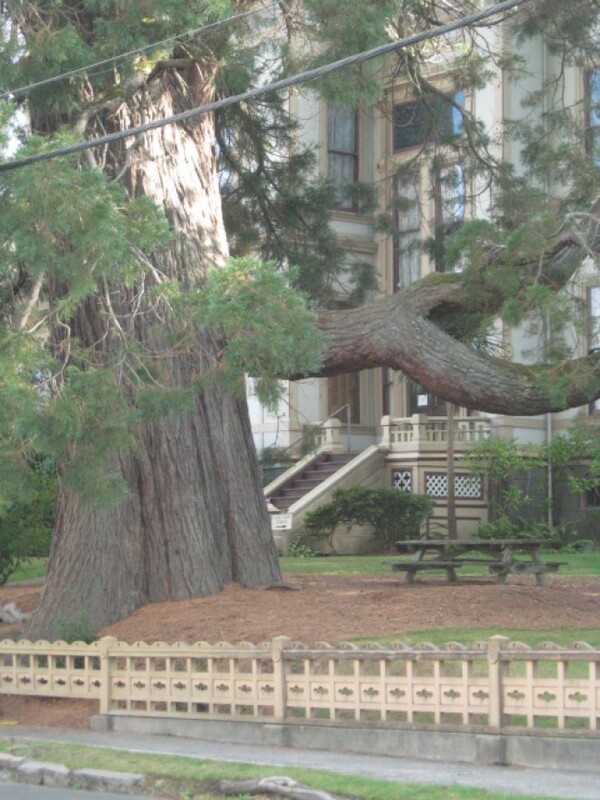 This giant sequoia tree was planted in about 1890 (after the house was built in 1885). It's on the grounds of the Captain George Flavel House, a Victorian mansion built by an early day ship captain & business man in Astoria, Oregon. The story of the house is well documented; it is owned by the Clatsop County Historical Society & open to the public. http://www.cumtux.org/default.asp?pageid=35. Thanks to William Barnett for sending us these wonderful photos. John Yount sent us a picture of his giant sequoia tree in Beaverton, Oregon. John said “My first wife, Kay Elizabeth (Leland) Yount found a discarded 12” Sequoia in back of K-Mart in a characteristically black plastic bucket—-$1.98 in 1983. At her bidding I put it in a half oak wine barrel in potting soil for three years. That spring I hit the bottom of the barrel with a shovel and dropped the nearly root bound ball into a three foot hole in a corner of the backyard— Here it is 33 years later, her memorial after her death from brain tumor in 1997”. John, thanks for sharing the story and history of your tree. 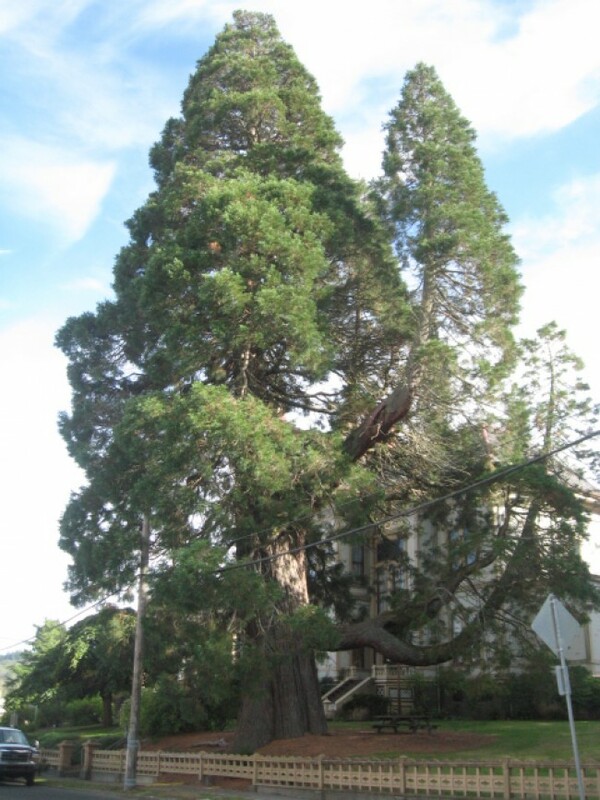 This giant sequoia tree towers over the Captain George Flavel House in Astoria, Oregon. According to records, this tree is almost 130 years old now. Thanks to William Barnett for sending us this photo. Thanks William Barnett for sending this historical photo of the Flavel House. 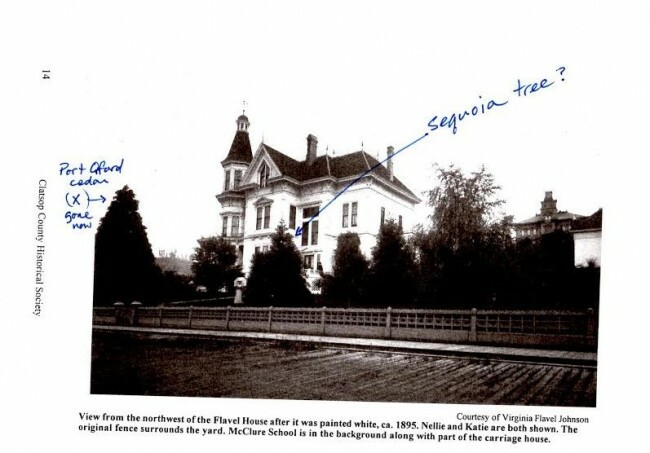 He said, "The photo I'm sending says the house was painted white in 1895, so this photo is after that, but what looks like the sequoia is a pretty well-established tree by then (there are 3 trees in the photo, all about the same size, in the general area of the present day sequoia). If the girl with the parasol standing nearby is 5ft tall, the tree must be at least 15 ft tall. There are also some notes I've seen that specify that the gardener (Louis Schulz) actually started planting the landscaping before the house was built". This is a giant sequoia tree in Sunset Village on Swegle Road in Salem, Oregon. It is 60 to 70 feet tall with a 6 foot diameter at the base. Contributed by Bob Salyers. Behind the Home Grown Gardens Nursery are dozens of mature beautiful giant sequoias which gives one a chance to see the tree growing in rows. The trees are about 20 feet apart. The nursery is located south of Corvallis on the SE 3rd Street. 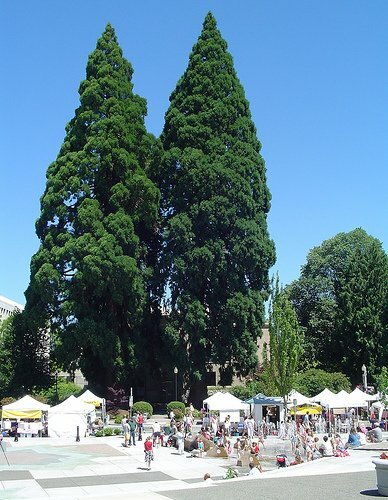 Almost every property or park in Oregon has giant sequoia trees growing well. 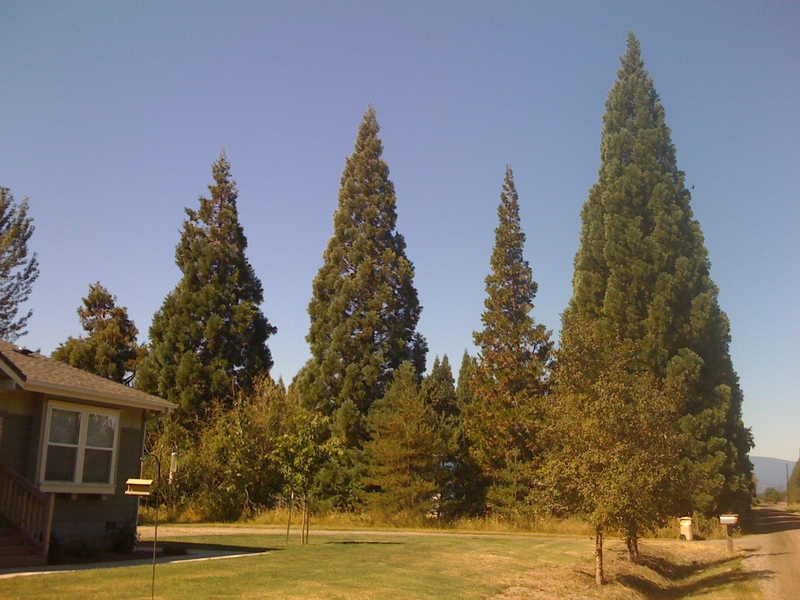 This is another view of the rows of giant sequoias behind the Home Grown Gardens nursery south of Corvallis. A panorama of about 20 mature giant sequoia trees located at the Valley Catholic School in Beaverton. The seeds were planted in 1932. Click on the image to see the full view of this panorama of four photos. These images were taken in 2010 by Mario Vaden. He is standing in the middle of the row of giant sequoias with his parked truck. Mario works as an arborist/landscape designer in Oregon and another aficionado of redwoods. 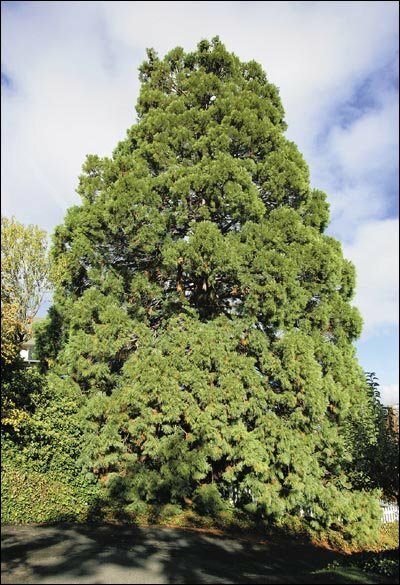 Suzanne from Astoria contributed this image of her older giant sequoia growing on the property in Astoria along with their new tree from our nursery to add to their collection of healthy conifers. 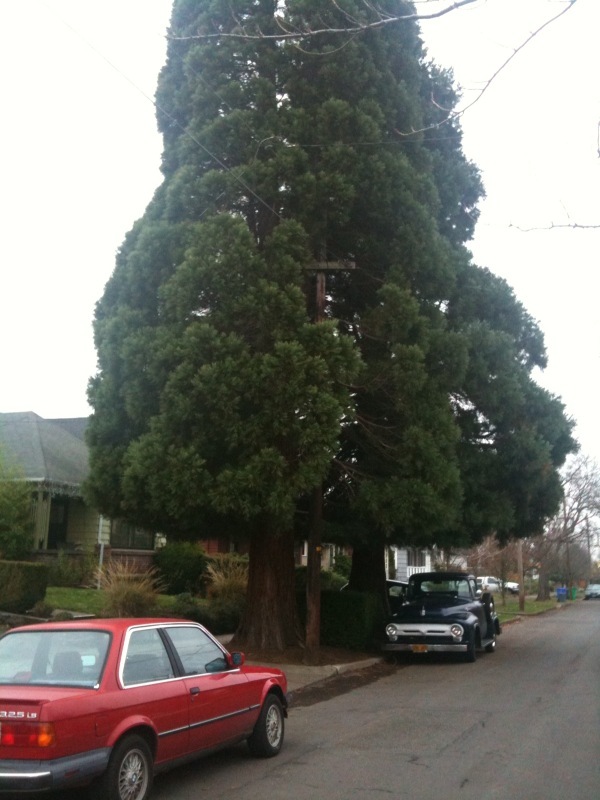 A mature 49th avenue giant sequoia with part of the infrastructure of Portland taken by James Parson. The old truck appears very secure parked next to the giant. 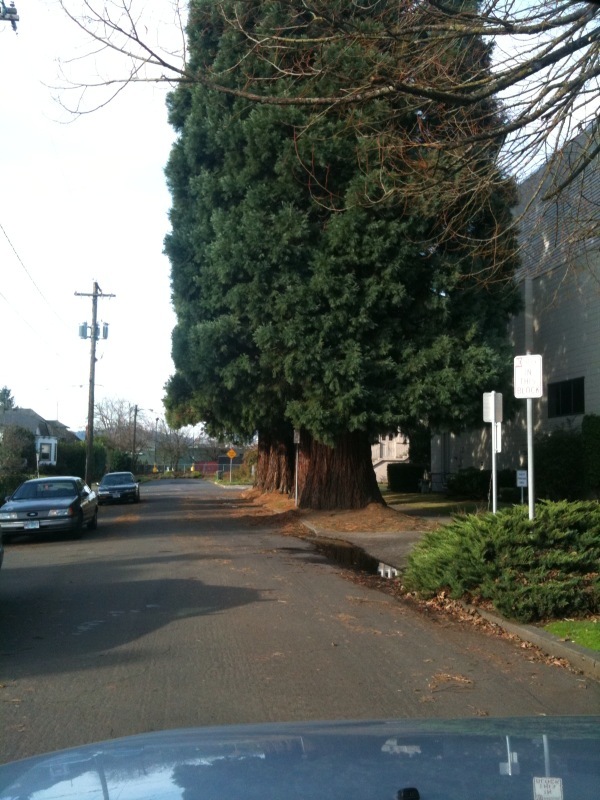 James Parson captured this row of urban giant sequoias on east side of Portland with his iphone. 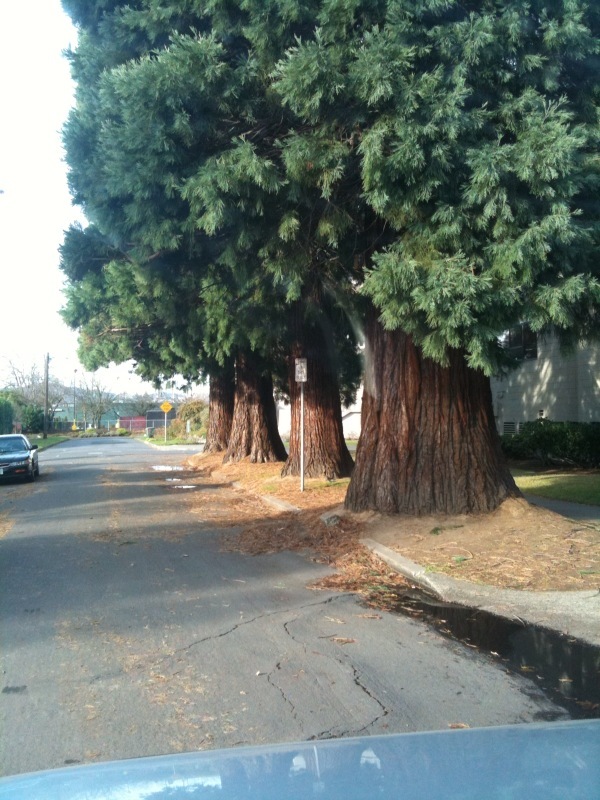 This shows the health of a mature giant sequoia within the city. A close up of the urban street trees taken by James in Portland. Trees appear very healthy. The street is a bit stressed with root push up. 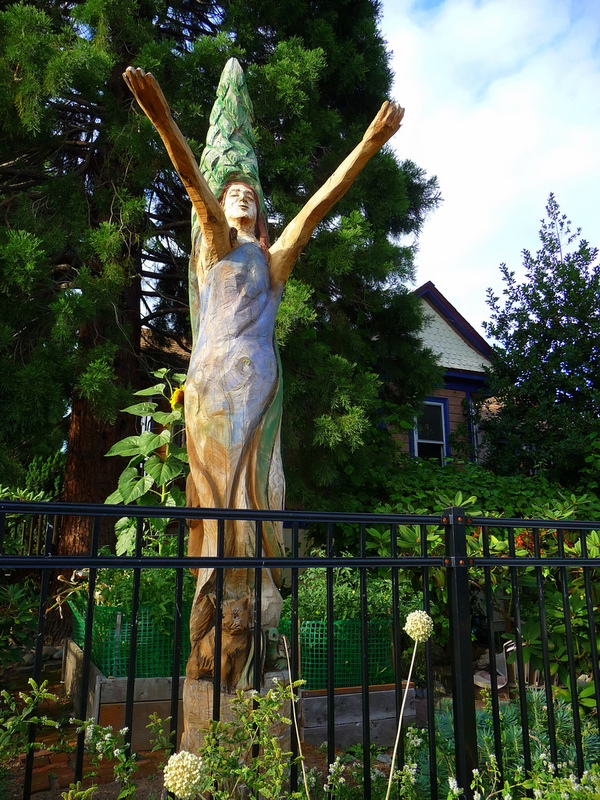 From flickr photographer graygoosie who spotted this sculpture along with a beautiful giant sequoia in the yard of friends in Portland. The tree was crowding the Sequoia so she became art. Sculpted with a chainsaw, it's breathtaking, traffic stopping and raises emotion just by being near her. 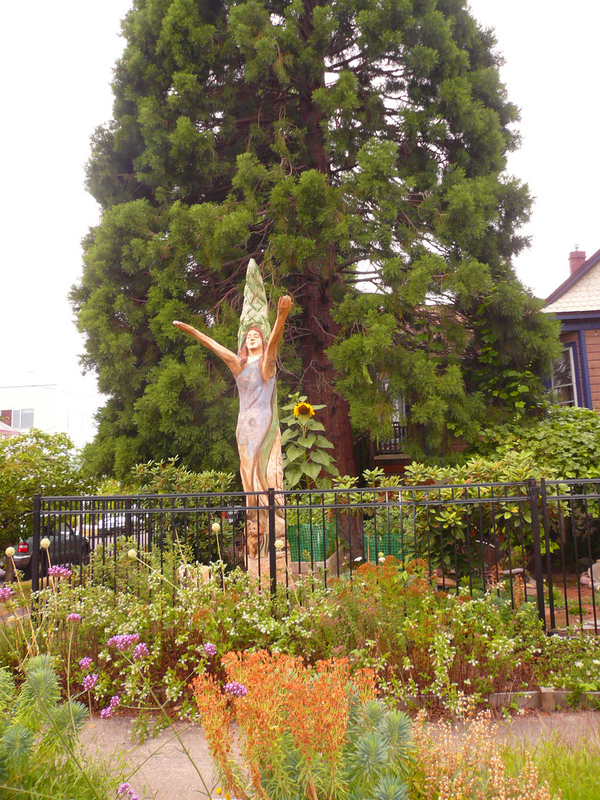 Another image of Portland giant sequoia with tree sculpture woman taken by -graygoosie-. Notice the cat and the turtle carved into bottom. Dundee tree - bought this tree from you in 2006 and planted them at my house in March 2006 in Yamhill county at 4 feet tall. This tree is approx 5 feet tall now. My name is Donald Miller from Dundee. Prospect Oregon - This is a picture of the tree at the Prospect Hotel. It's approximately 75 to 80 years old. This photo was sent to us by Bill King. 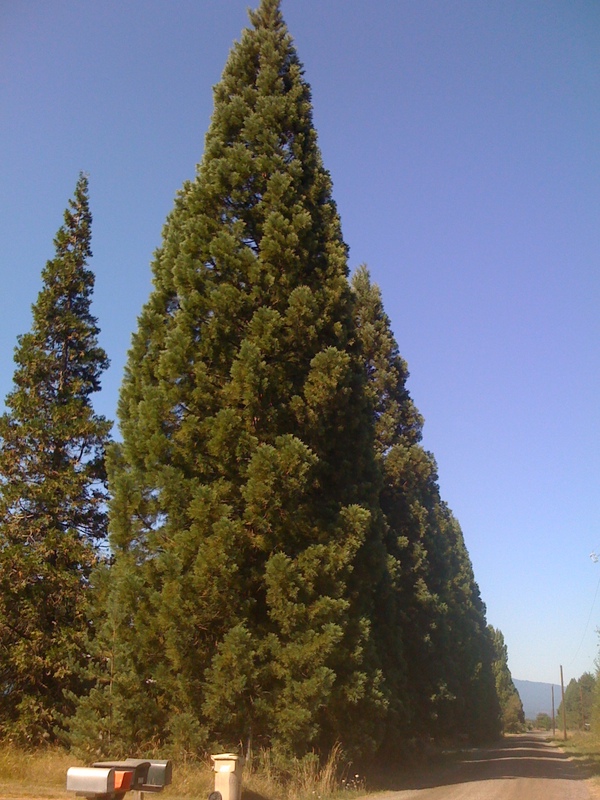 This tree appears to be growing in the absence of irrigation in Prospect, Oregon. Ashland Tree - City: Ashland, State: Oregon. 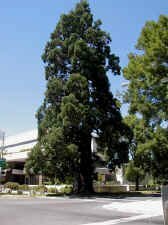 A 70-foot-tall sequoia is Ashland's "2005 Tree of the Year" stands at the corner of Bush and Almond. 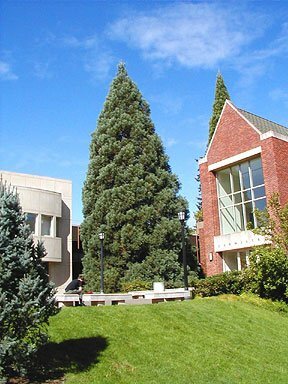 Hilsboro Courthouse - These are 2 very old and very tall giant sequoia trees (sequoiadendron giganteum) on the lawn of the Hillsboro, Oregon, Courthouse. The crowd at the bottom of the picture is from the Saturday Market.